With more than 400 miles of rapids, the Chattahoochee River does more than form the majority of the Georgia-Alabama border—it also provides unique and affordable outdoor entertainment for fun-loving locals looking for ways to cool off and enjoy the great outdoors. 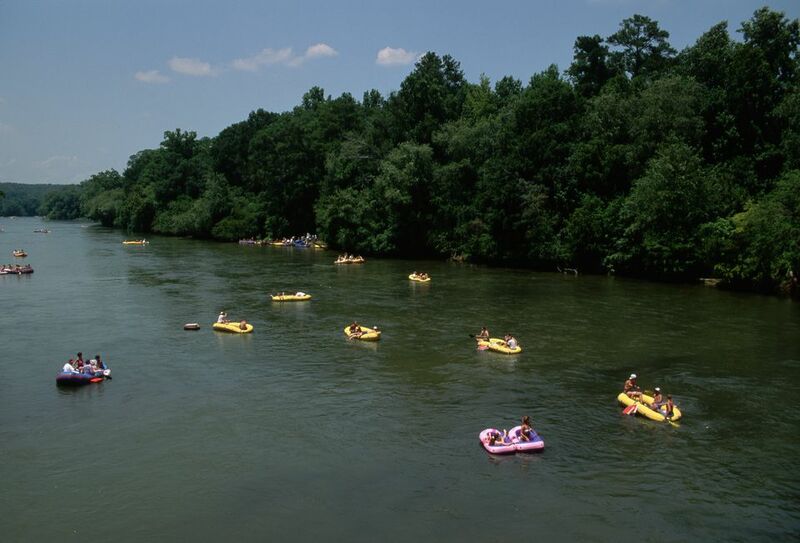 In fact, tubing down the Chattahoochee River has become such a popular summertime activity in Atlanta, it has even earned its own nickname: Shoot the Hooch. Whether you crave an inside-the-perimeter encounter with nature or want to drive north of the city into the beloved Bavarian town of Helen, Georgia, you’re able to experience the history of this storied river while beating the heat with your family and friends. Click through the slideshow to determine which Chattahoochee River tubing option is best for you. Overview: Atlantans can experience the scenic greenery of the Chattahoochee River right in their own urban backyard. The river runs straight through the middle of Atlanta, and one of the city’s top summer activities is floating down it with family and friends, and a cold drink in hand. You can also enjoy more of Atlanta’s many summer activities after your float. Where to start: Where you begin your experience on the river depends on which rental company you choose to get your equipment from. Start planning your day on the ‘Hooch by visiting the National Park Service website for an estimate of how long floating from each checkpoint will take you. The amount of time you’re able to spend on the river will help you choose which rental company is best for you based on its location to certain checkpoints. Rental companies: The National Park Service has a list of authorized companies available for equipment rentals, many of which also provide a shuttle service to take you back to your vehicle after you’ve finished your float. We’ve outlined the most popular below. Shoot the Hooch: With the option of embarking on a 1.5, 3 or 8 mile trip down the river, this rental company offers an array of different vehicles to choose from, including canoes, kayaks, rafts, and stand-up paddleboards. There is a $1 per person National Park Service Fee for each rental. You can also bring your own food and beverage sans glass and Styrofoam coolers on your trip. Nantahala Outdoor Center: Take advantage of the center’s half-day or full-day excursions on the Chattahoochee. Prices range from $24.99 to $54.99 and include your equipment rental, paddles, live vests, shuttle service, and a small dry-bag. You can choose between tubes, kayaks, stand-up paddleboards, inflatable kayaks and inflatable rafts for your trip down the river. Money for the cost of equipment rentals. This will vary with each rental company. If you are using your own rafting equipment and don’t need rentals, bring along $3 for parking at the different river checkpoints. Bring along your own drinks (alcohol is permitted) to enjoy while floating down the river. Most rental companies allow you to rent a tube for your cooler and tether it to yours. Just make sure there’s no glass or Styrofoam. Remember to wear a swimsuit or light clothing, because you will get wet. Bring along other sun necessities, like sunscreen, sunglasses and a hat. Overview: Tubing the Chattahoochee River in Helen is different from inside the city. Getting out of the city can always be a nice change, but tubers are not allowed to bring alcohol on the river within the Helen city limits. While we all love a cold brew on a hot summer day, summer barbecues are just as fun, and there are plenty of grills for tubers to use. There are two main rental companies (outlined below), and other water vehicles, such as kayaks and stand-up paddleboats, cannot be rented. After your experience on the river, take time to enjoy the Bavarian-inspired city of Helen before you head back to Atlanta. Where to Start: Each of Helen’s tubing companies is located just near the heart of the city. Because the starting points of your float will be nearly the same, begin planning your experience based on the amount of time you want to spend on the river. If you want to tube down the ‘Hooch for no more than an hour, look into Cool River Tubing, which offers two trip lengths to choose from. However, if you want to float all day, check out Helen Tubing & Waterpark, where unlimited floating is free when you buy a ticket to visit Helen’s only waterpark. $3-15 based on which tubing company you choose. Prices vary based on different rental packages. A “push-off” stick. The Chattahoochee is rockier and shallower in north Georgia. This will help you navigate if you get stuck while tubing. Water shoes. Because of the rockier waters in Helen, water shoes are recommended to keep your feet safe while tubing. Cool River Tubing: This company offers the most variety, whether you have 1 or 2 hours to float, you’ll get to choose between a one-time trip, unlimited floating, waterslides, and other combo tickets. If you’re going with a group of 10 or more, you’ll save $1 on each ticket option. No coolers are allowed, but each tuber can carry along a single 32 oz. drink. Tubers must be 3 years or older to float down the river. Helen Tubing & Waterpark: Although there is only the option of a 2-3 hour float down the river, this tubing company has its own waterpark for visitors. Tickets for the park, which include unlimited tubing throughout the day, are $15 for adults and $10 for kids less than 42” tall. However, if you don’t want to visit the park, a one-time trip down the river is $3 and unlimited tubing is $8. There are no age restrictions with this tubing company; special tubes for infants and senior citizens are available at no extra cost. Coolers are not allowed. However, there are exceptions for anyone with diabetes. If you’re bringing your own equipment to go tubing, remember to bring a life vest. Most rental companies provide one in the cost of equipment, and even if you don’t wear it, you must carry it with you. Don’t bring any glass or Styrofoam. It can injure yourself, other tubers and the wildlife that call the Chattahoochee home. Don’t dive in the river. Even in deeper sections of the river, the bottom is still somewhat shallow and very rocky. Be prepared to visit with the Chattahoochee’s wildlife during your float. You might encounter fish, turtles, otters and other water creatures. Enjoy them from a distance for both your safety and theirs. Be responsible. Don’t drink too much alcohol, because you will be in the water. Also, remember that rapids might be a bit rougher after a storm.